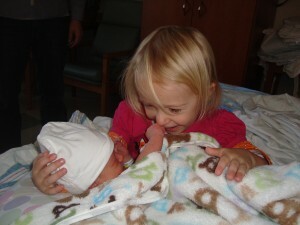 Proud sis, Lilly, welcomed her baby brother, Henry, at 8:29 a.m. on Monday. The whole family is back home together and enjoying our newest addition. Despite the fact that his sister was a whopping 8 lbs. at birth and that I made several pre-delivery trips to return newborn clothes that I was convinced Henry would be too big for, this little guy weighed in at only 6 lbs. 9 oz. I can still hardly believe how tiny he is, but he is 100% sweetness. I’m in love. The He’s Here! by MushBrain, unless otherwise expressly stated, is licensed under a Creative Commons Attribution-NonCommercial-NoDerivs 3.0 Unported License. Terms and conditions beyond the scope of this license may be available at mushbrain.net.